This gala event benefits the San Jose Woman's Club Scholarship Program. Enjoy an elegant luncheon menu and live performances by exceptional Resident Artists from Opera San Jose, enhanced by the acoustics of our beautiful, landmark Clubhouse. Guests may dedicate an aria from the program for a suggested donation of $25. More than 150 attendees enjoyed lunch with the stars of Opera San Jose and supported our Scholarship Program. For more information, contact opera@sjwomansclub.org. 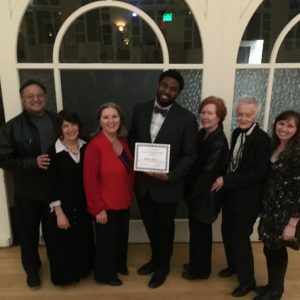 Each spring, San Jose Woman’s Club hosts a free, live vocal competition as San Jose State University voice students compete for the SJWC Vocal Scholarship. This public event dazzles the audience with the quality and talent of the students. Guests are invited to meet the performers afterward over cookies and coffee while the judges deliberate. The winner is announced that evening. For more information, see here.